Earlier this week I was featured in the CSU daily newsletter, Today @ Colorado State University! One of the writers for this newsletter contacted me because of the article in the Coloradoan. Within this article I gave three golden nuggets of advice for young entrepreneurs. Over the last few weeks JuniorBiz and I have been featured in two major local newspapers, The Fort Collins Coloradoan and The Longmont Times-Call. In this JJ Entry I’ve included links to both of those articles, as well as described how and why both reporters contacted me for my story. Saturday, July 11th at midnight I embarked upon a journey to climb four 14’ers in one day. For those non-Coloradoans, a 14’er is a mountain that is 14,000+ feet above sea level. There are over 50 14’ers in Colorado and I plan on climbing each one. In my most recent expedition, I realized climbing mountains is similar to running businesses. 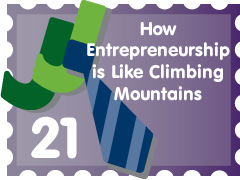 I’ve listed four obvious and four not-so-obvious similarities between entrepreneurship and climbing mountains.